"The Next Chapter in Our Long and Rich Brand History"
Leading custom tire manufacturer Avon has announced the next stage in the development of its Cobra brand tire program with the unveiling of the Cobra Chrome. 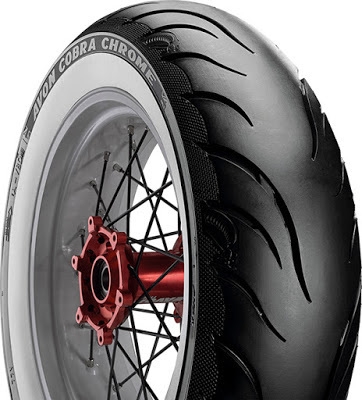 Available in extreme custom sizes with rear tires up to 23 inch and widths of up to 330 mm, the Cobra Chrome is said to offer "excellent wet braking and stability" thanks to enhanced compounds and new construction that deliver "improved stopping distances in wet braking tests, high stability in all conditions, with precise feel and tire feedback." 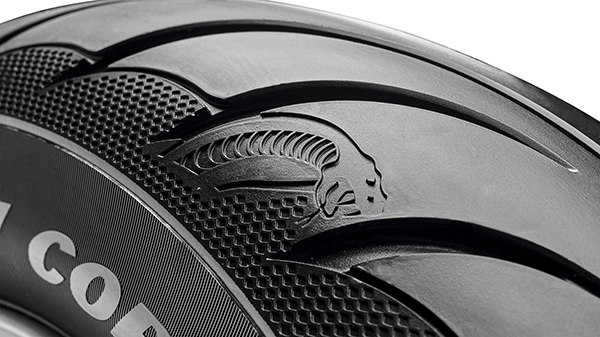 Avon's latest tread pattern and advanced construction produces an over 5% larger tire footprint compared to the existing Cobra, with improved tire life - its highly durable compound and latest technology tread pattern design delivering 10% extra mileage. Also available with white sidewalls, Avon says the Cobra Chrome is "the ultimate statement of individuality" and that the technology and rubber compound used to manufacture the unique durable white sidewall "remains a secret and has been crafted and refined over many years by our R&D department in the UK. With an increased size offering over the previous Avon Cobra, more riders will be able to enjoy the look of Avon Cobra Chrome whitewall tires." Avon has been well known as a preferred tire option for custom bike builders ever since the 1970s. "Our highly successful Avon Venom and Avon Cobra tires have a well established reputation in the custom and cruiser segments. "The next chapter in our long and rich brand history is the introduction of the Avon Cobra Chrome - the tire of choice for the cruiser rider in search of safety, the joy of riding and individuality. The Avon Cobra Chrome offers premium performance and a stylish Cobra themed design." Having recently signed a multi-year agreement to be Freestyle Class sponsor at the 2018 and 2020 AMD World Championship of Custom Bike Building - the winner will be the 'Avon World Champion Custom Bike Builder'- the company is one of the oldest motorcycle product manufacturers of any kind in the world, tracing its origins back to 1885. The company entered the motorcycle and sidecar tire market in 1911. Always an avid supporter of motorsport, Avon's dominance in motorcycle racing was historically so great that in its 1957 to 1963 'Glory Years' every solo world champion, including legendary Britons John Surtees and Mike Hailwood, rode to victory on Avon motorcycle tires (Surtees remains the only man to have won World Championships on two and four wheels). In the 1970s Avon's reputation as the custom motorcycle "go-to" was cemented through its association with industry legend Arlen Ness - an early adopter of Avons for his custom builds, and still an Avon enthusiast. Avon Venoms quickly became established as the preferred option for custom bike builders worldwide. Always noted as an innovator, with technologies such as Variable Belt Density, the inverted V-pattern and Force Following Grooves becoming widely adopted, fifteen years ago the company did much to facilitate what became known as the "Fat Rear End" boom, the popularity of single sided swingarms and right-side drives, as it made a series of wider tires available, including the 300 in 2003 and still popular 330 in 2004. Avon was acquired by Cooper Tire of the USA in 1997, and Cooper's fresh investment capital did much to position the business for the 21st century. In 2007 Avon capitalized on the popularity of its Venom series tires with the launch of the all-conquering Cobra line. In the years since, Avon has added to the strength in depth of Cobra options, and with the Cobra Chrome is now offering its largest yet range of fitment options, including the class-defining 330. Renowned for its distinctive tread patterns, outstanding mileage and long life, the new Cobra Chrome doesn't disappoint. Noted for its unique, super tough construction, the kind necessary for heavy-duty custom loads and long distances, the Cobra Chrome combines the characteristics needed for modern cruisers with leading sports tire technology, for improved handling and performance. In recent years the example set by the likes of Arlen Ness and legendary Briton John Reed has been taken up by hundreds of leading customizers and bike builders worldwide. Since its inception in 2004, more AMD World Champions, Freestyle class top twenty bikes, World Championship class winners and World Championship competitors of all kinds have favoured Avon tires than any other single tire brand - including the reigning World Champion Suicide Customs from Japan, who returned to defend his title in 2018. Suicide Customs marked a second consecutive World Championship in which the winner built with Avons - in 2014 the prestigious title was taken for a third time by Krugger Motorcycles of Belgium with "Nurb's", an Avon shod radical and futuristic BMW. "This was the jumping-off point that made a collaboration between Avon and 'The AMD' compelling," says Avon Marketing Director Michiel Kramer. "As a company Avon is proud of its heritage and as a custom bike tire market leader we are especially proud of our reputation as the tire of choice for so many of the market's greatest and most innovative designers and craftsmen. "The AMD World Championship has always been a showcase for that heritage, so forming an alliance was an obvious idea. We look forward to working with the AMD team and continuing to make a contribution to the outstanding work and achievements of this market's talented and passionate professionals and amateurs alike." Speaking about Avon's decision, AMD's Robin Bradley said: "We have always been very careful about the brands and businesses we engage with, where the work of the custom bike building community is concerned. Having successfully transitioned the AMD World Championship to Europe and into the superb INTERMOT Customized Hall 10 'Show-within-the-Show' at Cologne, we feel we are ready again to start allowing selected vendors to share in what "The AMD" means to custom bike builders. "We couldn't be happier that Avon is the first vendor we have been able to welcome into the family and know that the profile and value they will generate for our competitor community will help them to further their careers and recognition of their achievements and abilities."